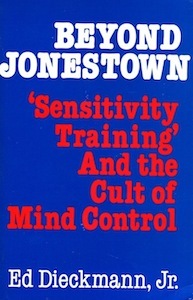 As a parole agent with the California Department of Corrections – where he was a training officer at the Parole Academy – the Author refused to teach ‘sensitivity training,’ recognizing it as identical to the self-criticism of communist regimes. It is a fight from which – especially in view of current efforts to use sensitivity training to push the Holocaust myth – the author has never retreated. Dangerous and sinister organization, as far back as 1949 spread the cancer that has helped weaken a once great nation and started the countdown to Jonestown. This organization is the Zionist Anti-Defamation League of B’nai B’rith (Children of the Covenant). It is fitting, in view of the doom that hangs over us, a manipulated society in which even our thoughts are controlled, that this book should have thirteen chapters. Perhaps Chapter Fourteen will yet be written, in which the warnings in this book are heeded – and the danger removed.